Each Kit Includes one unopened oyster (cultured freshwater pearl oyster) with a 6-7mm pearl inside. Colors vary, most common colors are pink, lavender, and white. Each pearl is a mystery contained within the oyster, you will need to open the oyster to find your pearl. The easiest method to open your oyster is to slide an oyster shucking knife (which is a very dull tool, akin to a butter knife (do not use a sharp tool, it is not necessary.) between the two halves of the oyster and move towards the center to disconnect the connection between the oyster and the shell and then the oyster will open easily into two halves. Consider buying a shucking knife with gloves for added safety. You can also cup the oyster in a towel while working to further protect your hands. Do not attempt to break or shatter the oyster, this will cause sharp edges which can easily cut through skin. Check out oyster opening videos online for more tips and hints. If you have a shellfish allergy you should not buy this product. 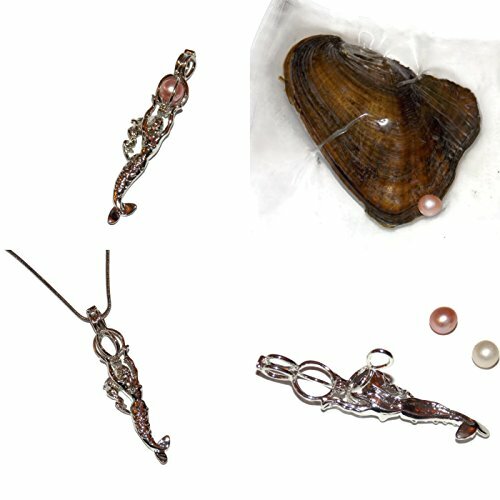 If you are afraid of opening an oyster please consider purchasing a kit which includes an already opened pearl. Wear protective eye ware when opening. If you dislike smells, take into consideration that this is a preserved oyster and will have a strong smell. These oysters are preserved, and not fit for consumption. Do not eat the oyster or feed it to any animal. Do not let children open oysters. Wash your hands well immediately after opening. Dish soap will help to take the smell off your hands. Opening oysters can be a lot of fun, but please read and follow all safety advice if you have never done oyster shucking before. These are real oysters farm cultured oysters containing real pearls. The exact size, color and shape of your pearl will not be known until you open your oyster. Cages can only be opened once they are off the chain. To insert your pearl, take the cage off the chain, open from the top down the middle, insert pearl, close cage and put back onto chain. View More In Jewelry Making Kits. If you have any questions about this product by Old School Geekery, contact us by completing and submitting the form below. If you are looking for a specif part number, please include it with your message.